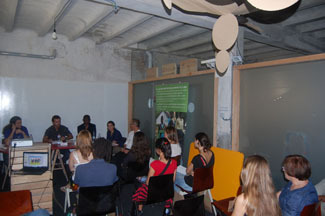 HUB Madrid was the venue chosen last Wednesday for the celebration of the Round Table entitled "The Challenge of Food Security in Africa: case studies of success in rural areas', which raised an interesting debate on issues like security versus sovereignty food, land grabbing and the influence of crops devoted to biofuel production. Maria Garcia, coordinator of the Delegation of Veterinarians Without Borders in Madrid, focused his presentation on issues such as land concentration, biofuels and the necessary accountability extraterritorial States, citing specifically that of Manica, Mozambique. 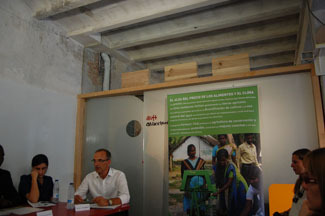 Santiago Merino, CIC Technical Batá in Maputo, Mozambique, meanwhile, raised the value of the peasant organization and work with organizations and monitoring committees structured opportunities for participation and greater ownership. Murphy noted in his paper the political factor and organizational communities to promote their progress. Javier Gutierrez, Conemund technical projects, focused his presentation on the project to improve food security for 600 families in the Department of Abalak, Niger, they are implementing. This project involves the establishment of 10 community gardens, different hydraulic, pumps, improved access to land and vegetable gardens are, among other actions. Arantxa Garcia CERAI technical projects-Center for Rural Studies and Rural Agriculture, presented, on the other hand, an experience of agroecology in Mauritania, a country in which they are conducting a pilot project to improve the food security of 199 small farmers in the communes of Ganki, et Lexeiba Kaédi in the Gorgol region. Garcia began as a concrete example of the importance of milk in this context. 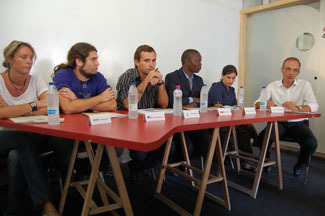 Bachir Afonso, project leader of the Farmers' Club of Cabo Delgado, Mozambique introduced farmer groups as key to promoting food security and self-organizing groups to encourage their progress. After the various presentations, attendees participated with questions and doubts, which generated a lively debate about food safety. The organization of the table has allowed the exchange of experiences with different organizations that implement projects in this area, all with common goals but sometimes philosophies are different.